Sika Everbuild MULTI-STICK is based on hybrid polymer technology it is the ultimate building adhesive, the first hybrid polymer grab adhesive especially created for the Trade. This superior adhesive has the ability to bond virtually anything to everything in both wet and dry conditions, and even underwater or in the rain. Incredible initial grab, high bonding strength, and almost limitless applications and other benefits, no tradesman should be without a tube of this next generation adhesive. Primer-less adhesion to all common building substrates, porous and non-porous. Can be used in the wet even under Water. 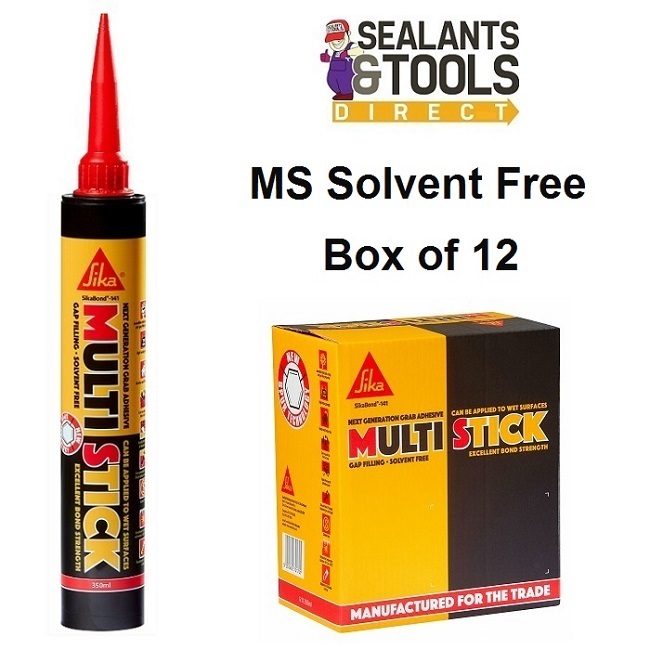 Used as a high quality nail replacement adhesive, even to damp surfaces. Bonding mirrors to most common substrates. Any application requiring high performance, durable bonding. Applications where resistance to chemical spillage is required. Do not use on polythene safety backed mirrors, polypropylene or Teflon. Always check paint-ablilty before using on large areas due to the sheer number of paint finishes it is impossible to test all.